Acrylic works by River City Art Association member Sandy Fisher will be featured next month in the Vigo County Public Library at Seventh and Poplar streets in Terre Haute, Indiana. In the RCAA Artist of the Month display in April, Sandy will shower her audience with May flowers and other paintings with a spring theme. Sandy is a lifelong member of the Terre Haute community. She attended Thornton, Woodrow Wilson and Wiley High schools. She also owned and operated a beauty salon for 42 years. Everything she does she gives credit to The Lord for giving her the opportunity to share her life with others through her paintings. Sandy’s artwork also has been featured in shows at Rose-Hulman Institute of Technology, Sullivan Area Art Guild gallery in Sullivan, Indiana, Gaslight Art Colony in Marshall, Illinois, and The Gallery in Clabber Girl Museum in Terre Haute. In August 2018, Sandy’s acrylic painting, “The Dress,” won the People’s Choice Award at RCAA’s 10th Annual Juried Exhibition. Also last fall, Sandy’s Native American paintings were showcased in the Carnegie Heritage Art Center of Greene County at Linton, Ind. Most recent, Sandy’s paintings were on display in RCAA’s Community Outreach Gallery in Terre Haute Regional Hospital. Membership in River City Art Association is open to Indiana and Illinois artists age 18 and older. For more details, call past president Todd Stokes at 812-232-0048. 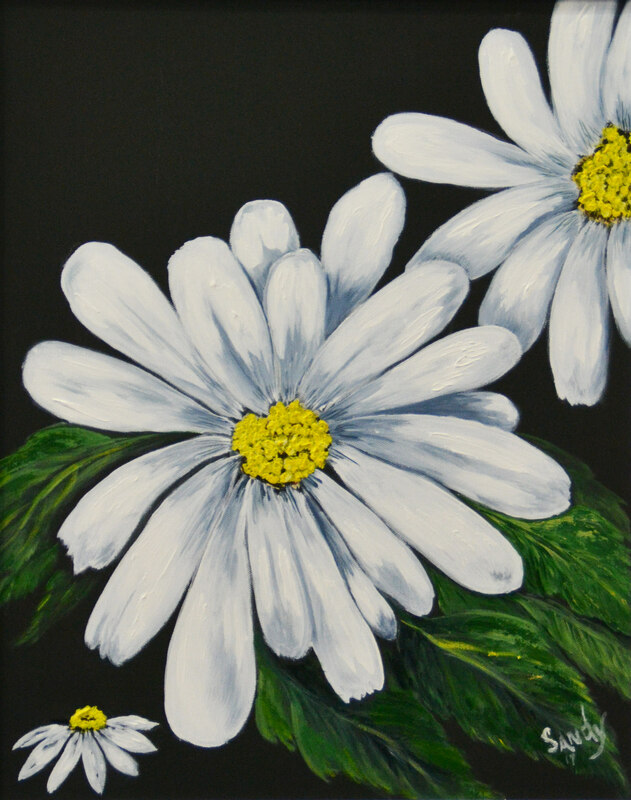 This entry was posted in Artist of the Month and tagged acrylic paintings, Baltimore Oriole, daisies, flowers, River City Art Association, spring, still life, Terre Haute. Bookmark the permalink.